It needs trimming, wiring and repotting. Portulacaria afra, Latin meaning “leaves like a portulaca” (which is known as purslane and moss rose) and “african” (it’s native to Africa). 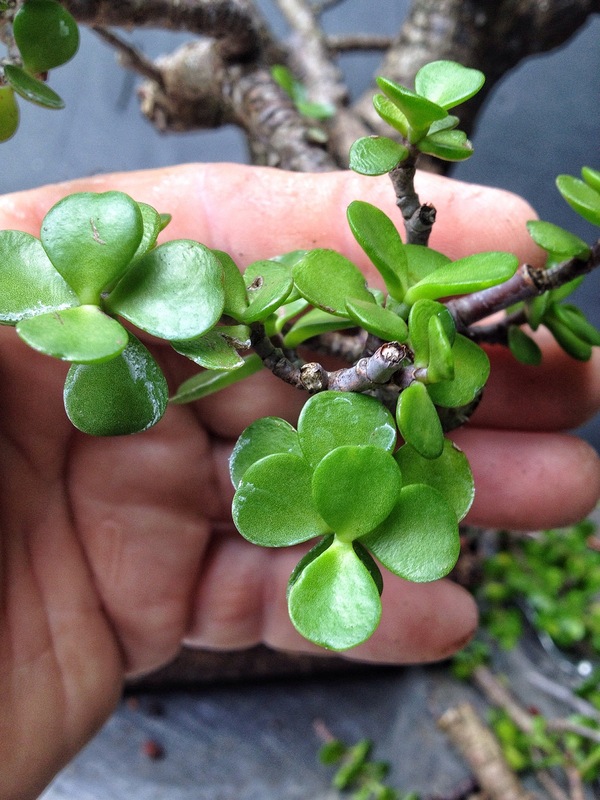 The portulacaria afra is called “dwarf jade” by many but it’s not related to the regular jade plant (crassulla species) except for superficially, both plants being succulents. 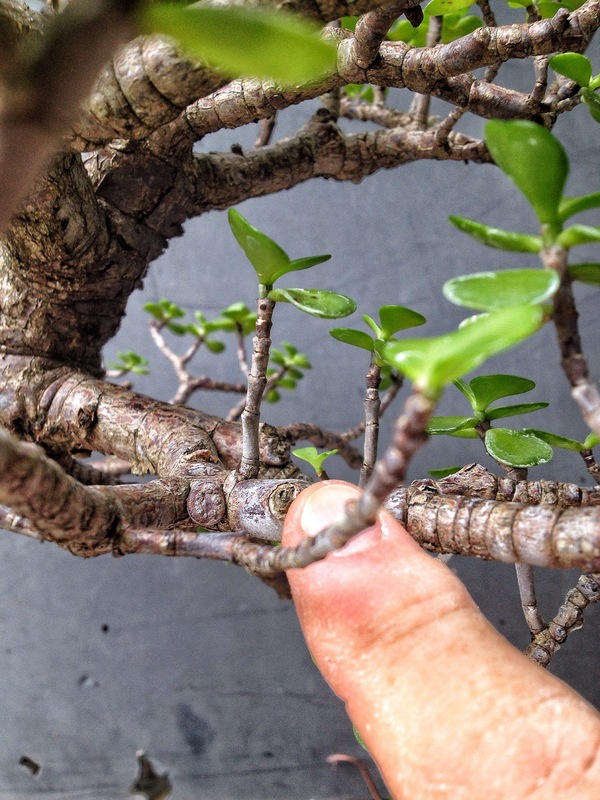 But the “dwarf” jade actually grows taller than the regular jade, and will develop a woody center in bigger specimens. 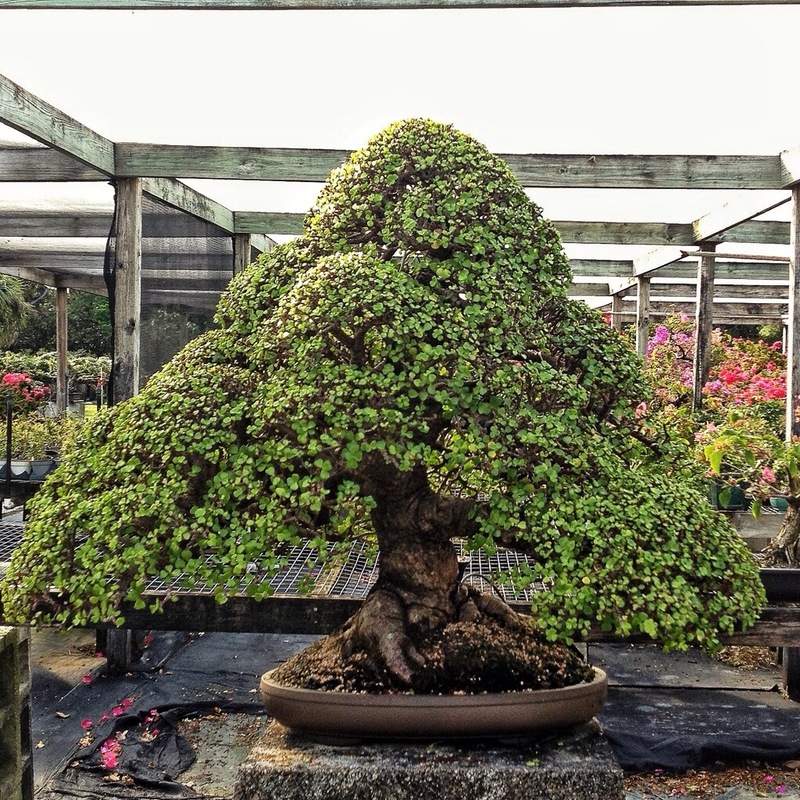 I wrote a pretty well researched post last year (click here) that was also reprinted in the Potomac Bonsai Association’s Winter 2014 newsletter (That’s right brother, reprinted!) 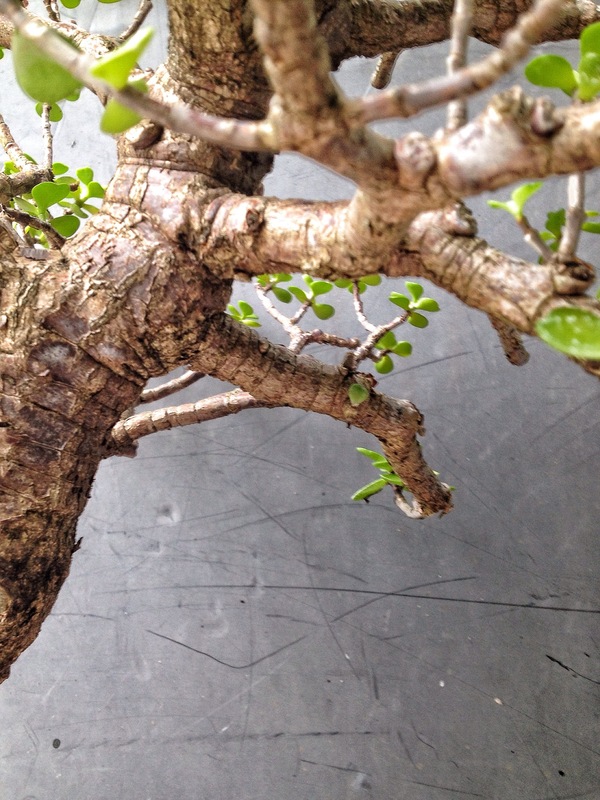 that has everything you ever wanted to know about portulacaria and probably some stuff you don’t. Let’s look at todays tree again. I need to remove some wire. I need to remove a few branches. The most work needs to be done on the roots. Which isn’t too much of a problem usually, except it stays too wet. 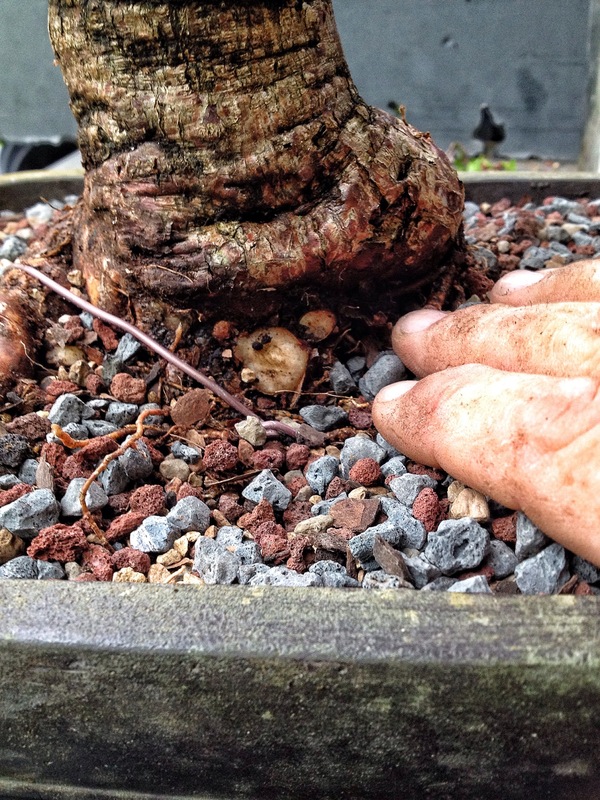 You may think that a too-wet condition would cause the tree to rot, it being a succulent and all, but a well established root system in bonsai soil can handle the daily, afternoon, Florida thunderstorms. What it’s been doing is slowing growth and arresting the development. 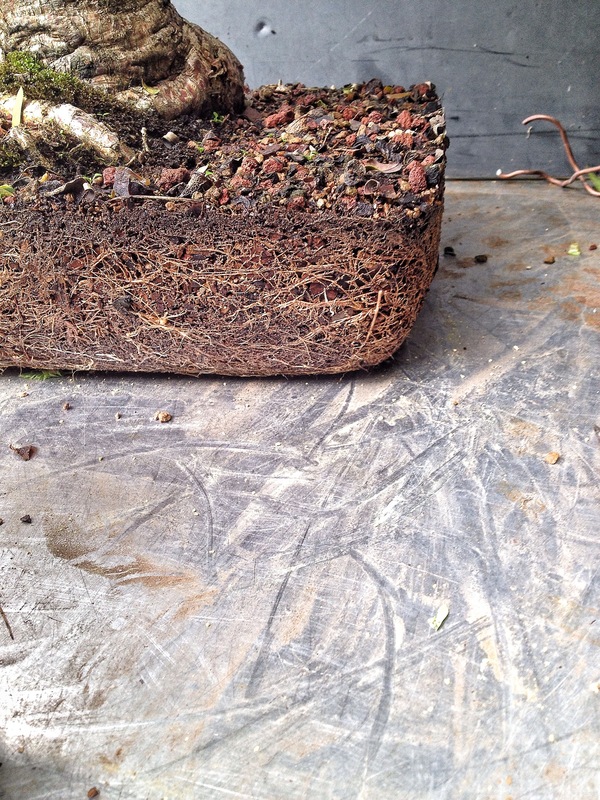 And I also need to clean up the surface roots; they’re bugging me. This is a tree where, against character, I am extremely conservative concerning the roots. 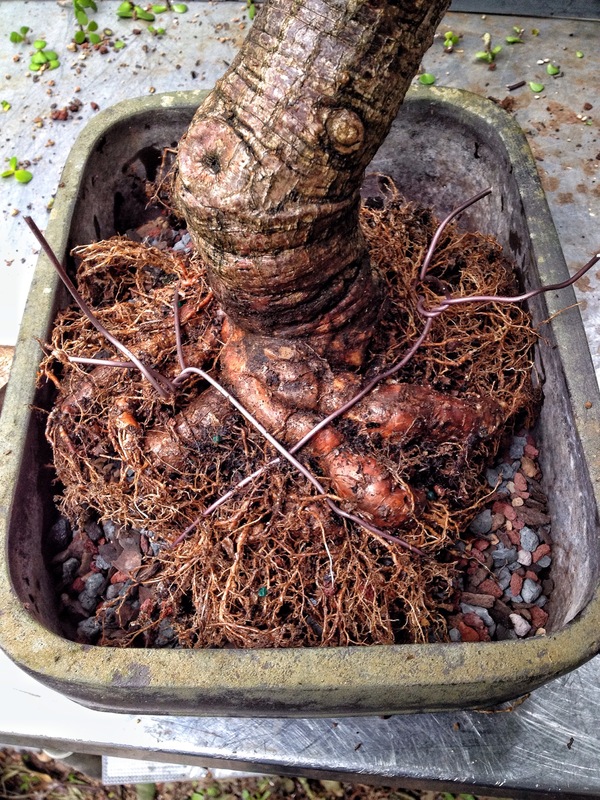 It will be the third repotting and each time I’ve worked the roots a little to improve them. The problem is that it will rot if I don’t allow the wounds I make to dry out before I start watering again. I’m going to start at the top on this tree. 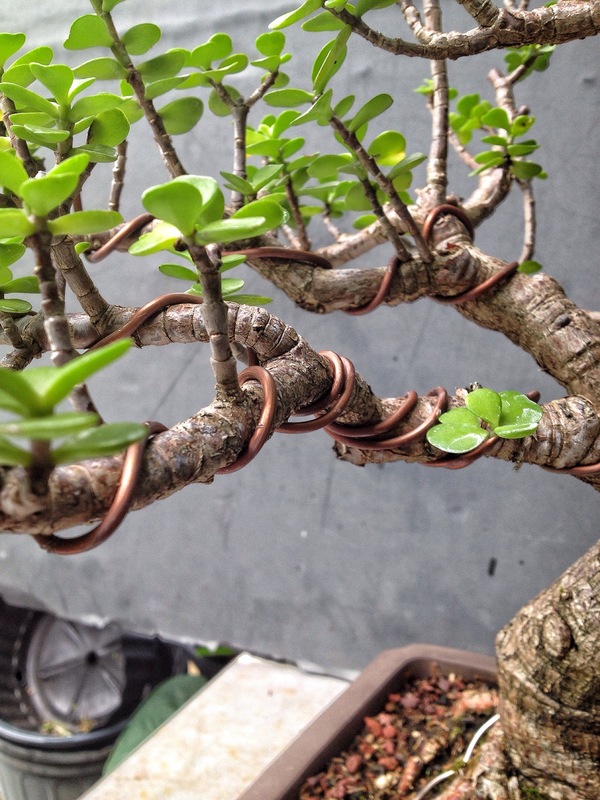 The jade has a tendency to put out odd branches growing straight up and in the weirdest places, like under the shade of the canopy. 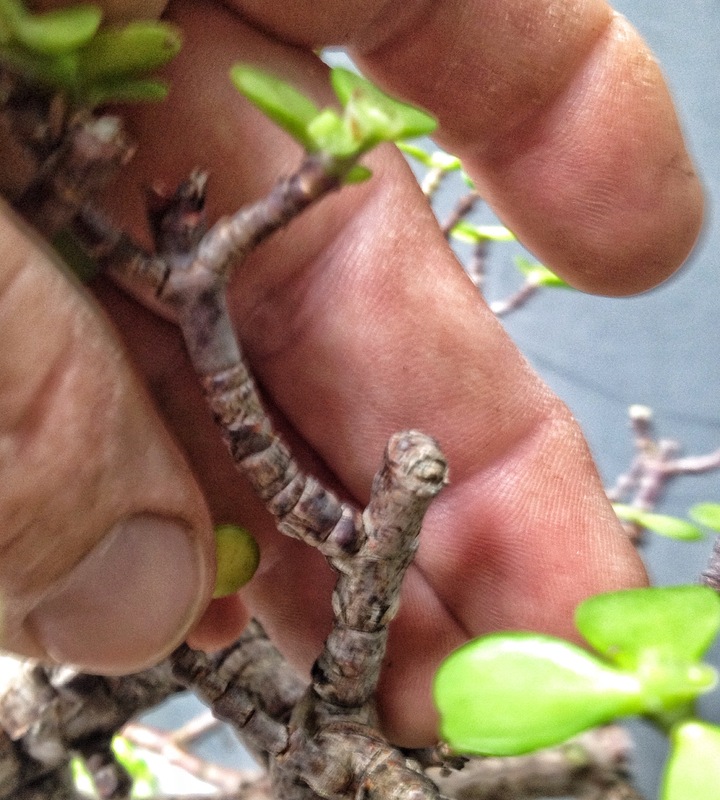 The dwarf jade has a way of keeping branches that are not ideal. -has been lingering on for about two years. Not really growing much but it’s still there with leaves on it. The weirdest branches are the totally alive but completely leafless nubs. There were probably about 5 or 6 them. Creepy….let me zoom in on it for you. 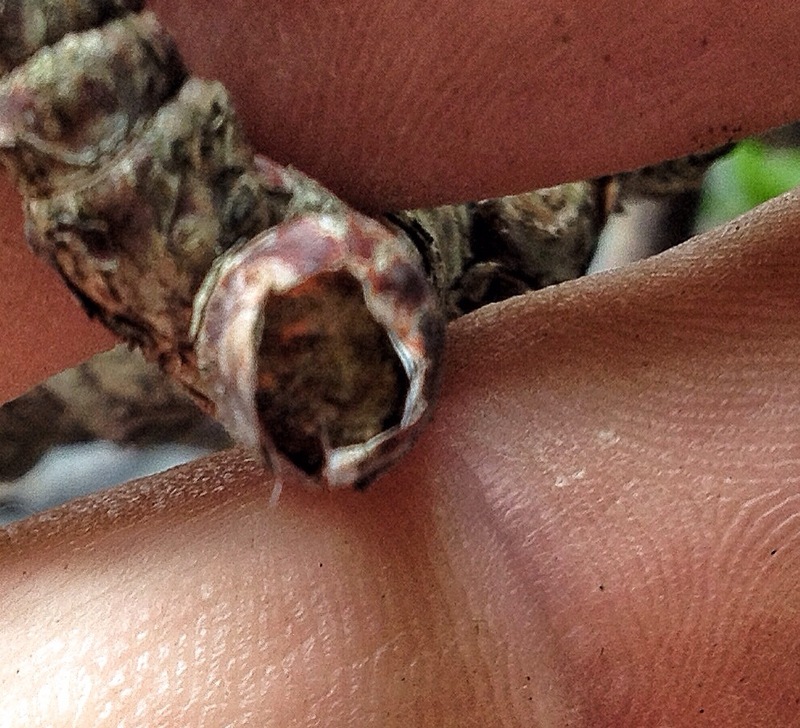 Staring back at me…..the ghost of the tree! Ok….relax, it’s not real, it’s not real, it’s not real. Sorry, I had an episode there. 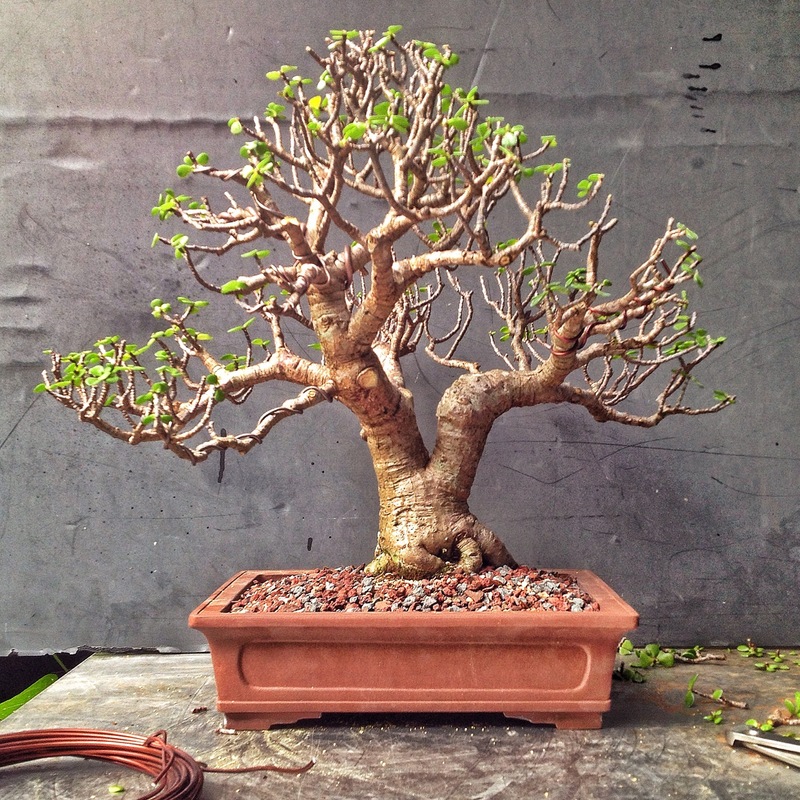 The best way to prune a jade for a dense canopy goes like this. We have a foliage pad. 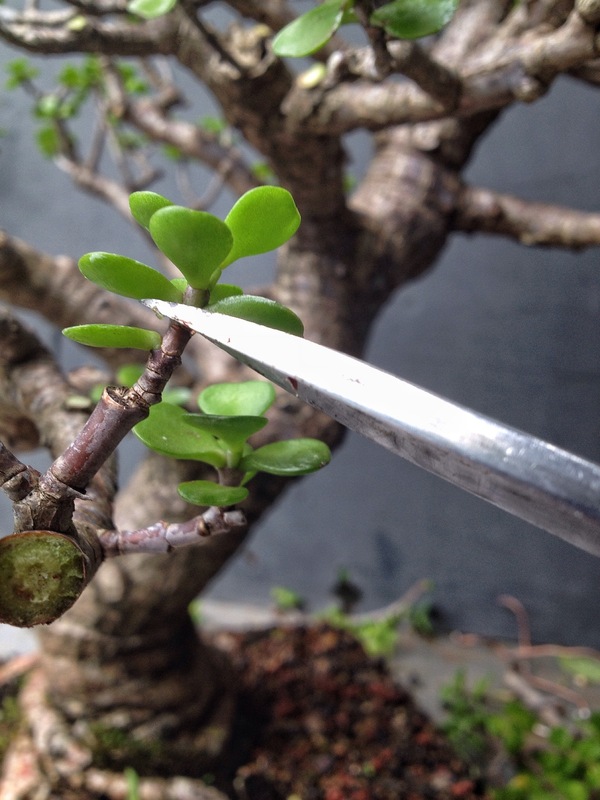 Trim each branch to two leaves. And from the junction of each leaf you should get two new buds. Let them grow out and trim again in the same way. During all this you have to really push the fertilizer. The two best growers of this tree, Jim Smith and Richard Turner, put handfuls of regular time release fertilizer on them. So much so that you can hardly see the soil surface. 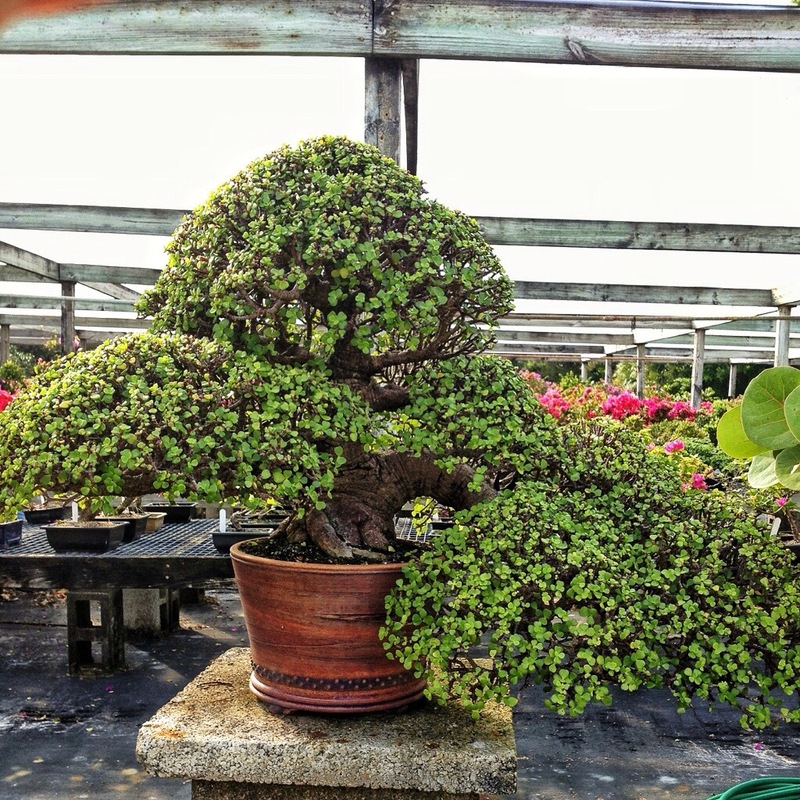 Richard won the Best Tropical award at the National show several years ago with this portulacaria. And here’s another tree from Richard. 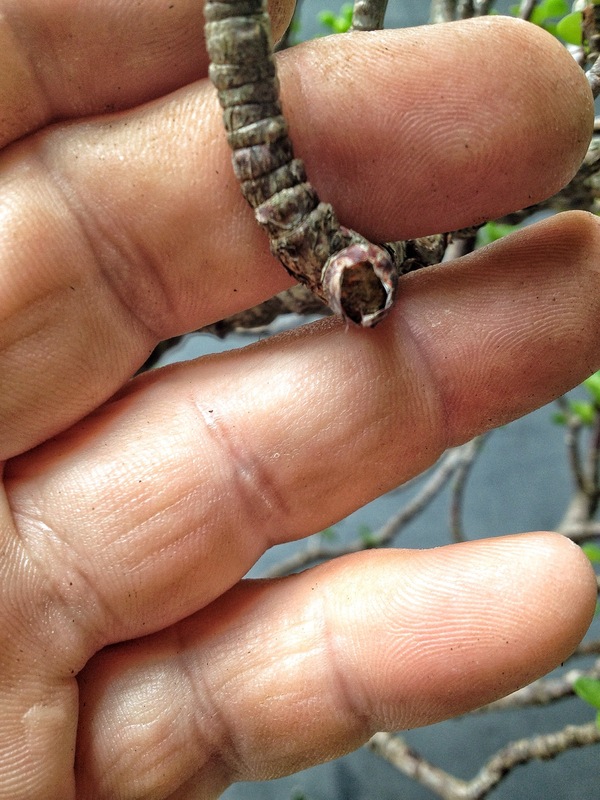 Getting back to my tree, this is how much I pruned off. It’s time for the rootwork. I had had the tree in this ugly pot. I’m switching to this fine Korean pot with superior patina. 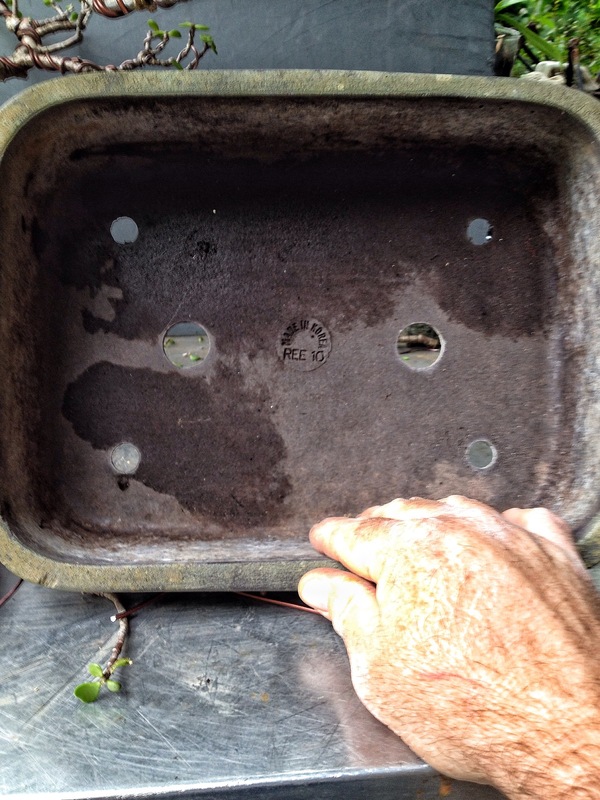 It has mucho drainage holes too, they don’t make them like this anymore. Ok, kidding about the pot. It’s a mica pot and the only one I have that’s suitable. 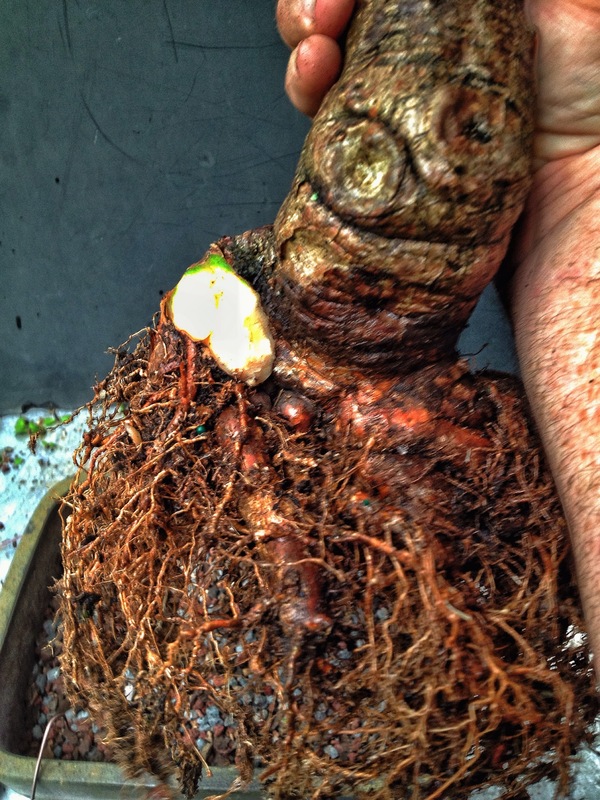 Now, the customarily blurry root photos. I raked out the roots and now, as you will see by the terribly overexposed, glaring white blurs, the roots I pruned out. It seems that I am unable to get competent photos of roots. I truly do apologize. This one came out good. I make absolute sure that the tree is firmly tied in. 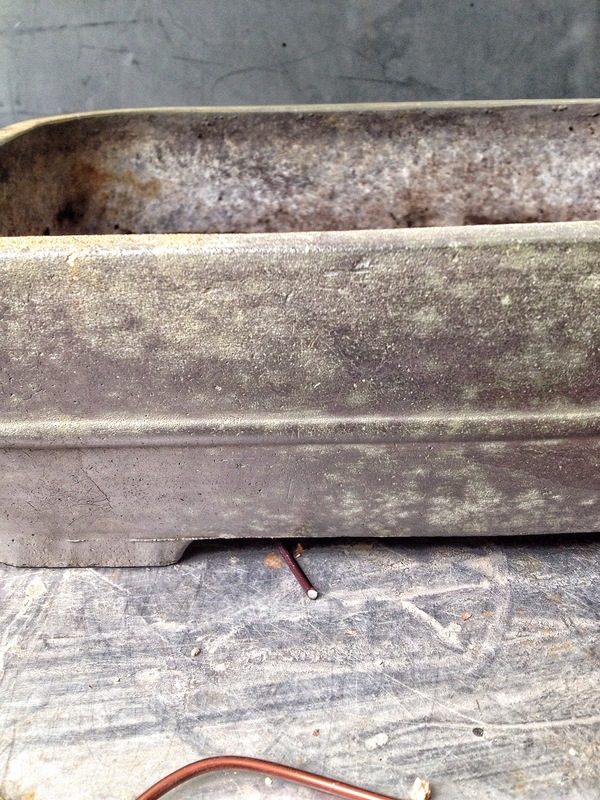 Any movement in the pot will set back root growth. The coarsest soil I have, sifted twice. And I make sure that the two wounds I created are above the soil line. The next week or so the tree will stay under cover to protect it from….no, not the sun but the rain. You should keep the tree dry until you see this. That means the roots are growing and can handle water again. 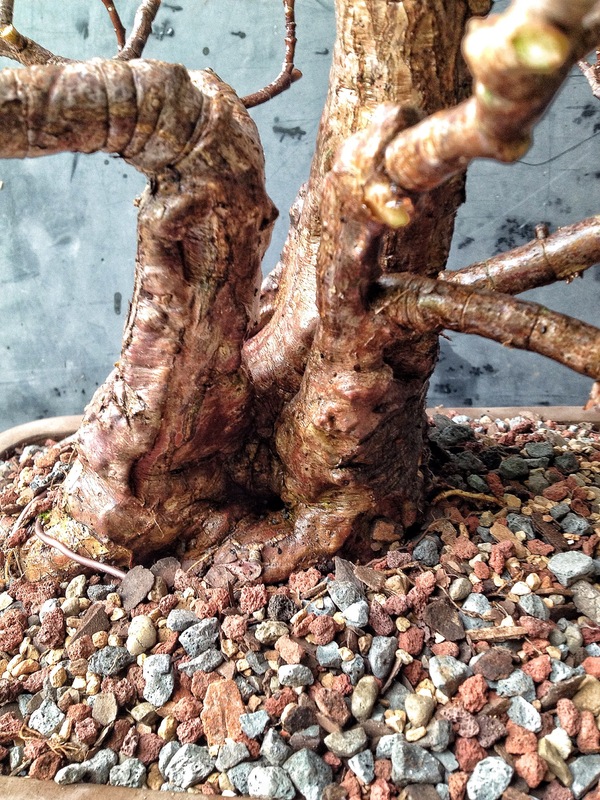 A jade’s roots seek moisture, that’s why keeping it dry is important after repotting. I warn you now, you’ll lose some (or most) of the old leaves on the tree. They turn yellow and fall off. We leave our tree dry and awaiting it’s return to the sun. And….wait, you wanna see the other trees? This one was given to me by Paul Pikel. It was a big cutting that had rotted through the middle and almost didn’t make it. The other tree is my oldest dwarf jade. It needed prit’near the same treatment. I changed the pot. I like it at the moment but it’s still not the right pot. And, since I’m a considerate blogger-ist, I’ll give you the before and after on the subject tree. 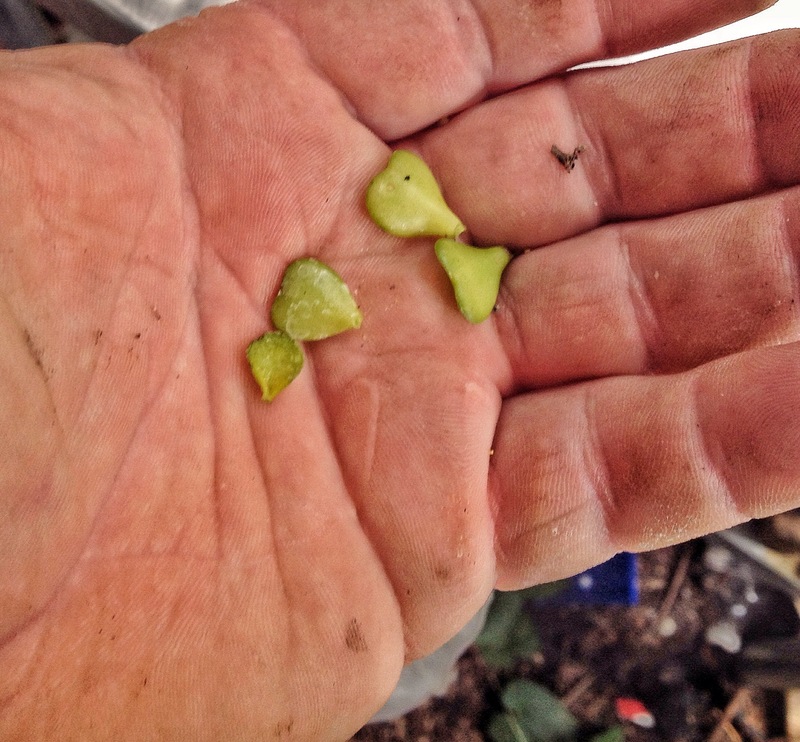 After the hardening off period it goes into the full sun with gobs (GOBS!) of fertilizer until the end of November (that’s about when winter starts) and it goes dormant. I am planning an experiment this winter on some indoor growing techniques with full spectrum fluorescent lights and bottom heat and I might use this as a subject. Stay tuned for that sometime next year though, it’s still hot as balls outside right now. Prev Total Willowleaf Ficus Drama! The variegated one just doesn’t grow fast, even here in Florida. I haven’t seen one much larger than an a two inch thick trunk myself. Best photos on the internet! Is it OK to treat my “real” jade the same way? What’s the best way to send more info, questions and some photos? Indoor bonsai experiment? reddit is going to eat you alive, man. Don’t do it! It’s more of an indoor overwintering experiment and it will be purely a temporary, survival thing but I hear you Len. Whenever I post something heretical on reddit and I get a troll I can usually put them in their place. Great post (again). Good growing tips. 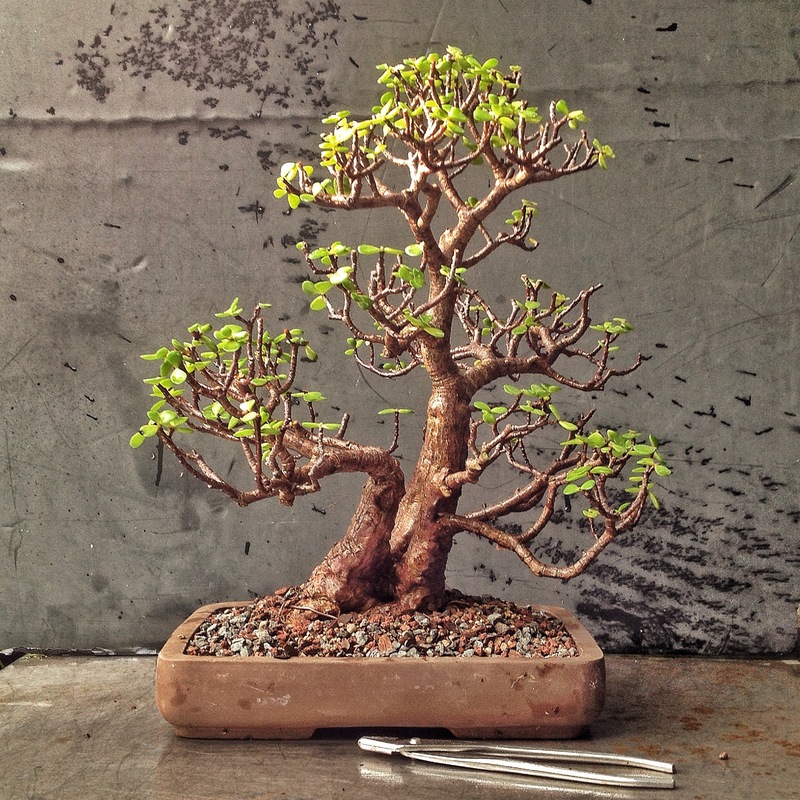 These make very nice bonsai. You have some of the best I have seen. 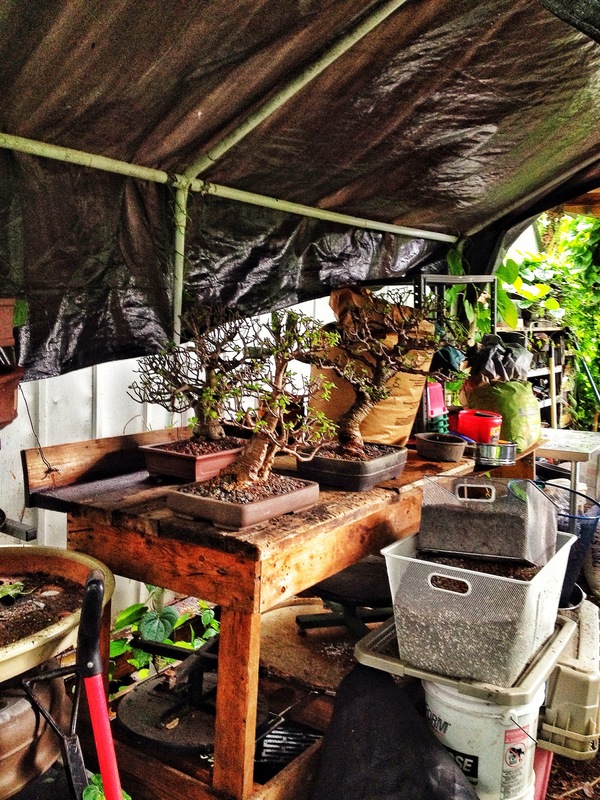 Now my family has grown and moved on and I no longer work, I am so eager to try my hand at jade bonsai. 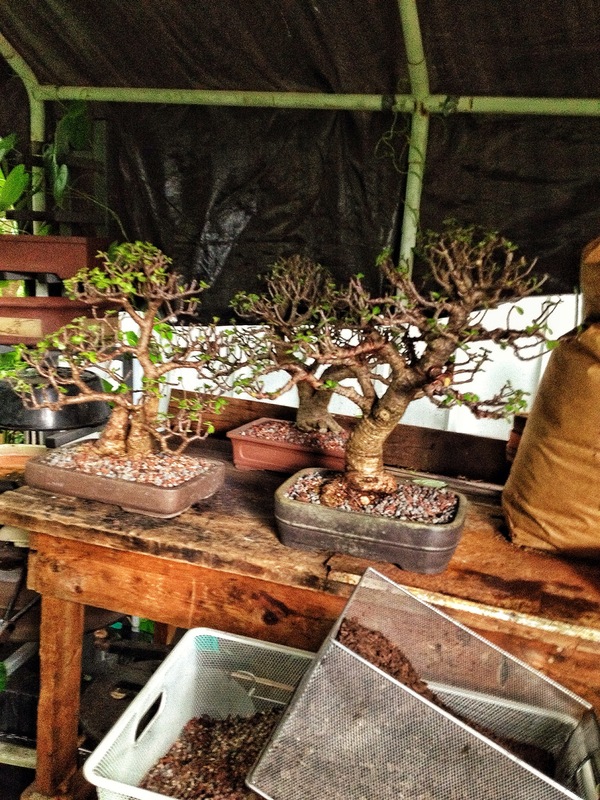 I have done heaps of reading and looking at photos and “real bonsais” Your info and photos have been so helpful. Just wanted to say thank you for sharing your knowledge. We have just began Autumn so I am collecting materials and just letting my trees grow for now and our winters can fall to frosty -15c so much preparing is happening. Another great article. I see myself bugging you on this ‘furt’lizer’ subject. You know, the principle of the thing. Hello! I have this variegated Jade and I am interested in making it into a bonsai. It is mid-january and it is pushing new growth at the top. Should I wait a few months to prune it or do it now? Which leaves/branches do you think I should take off? Any help/comments are greatly appreciated! 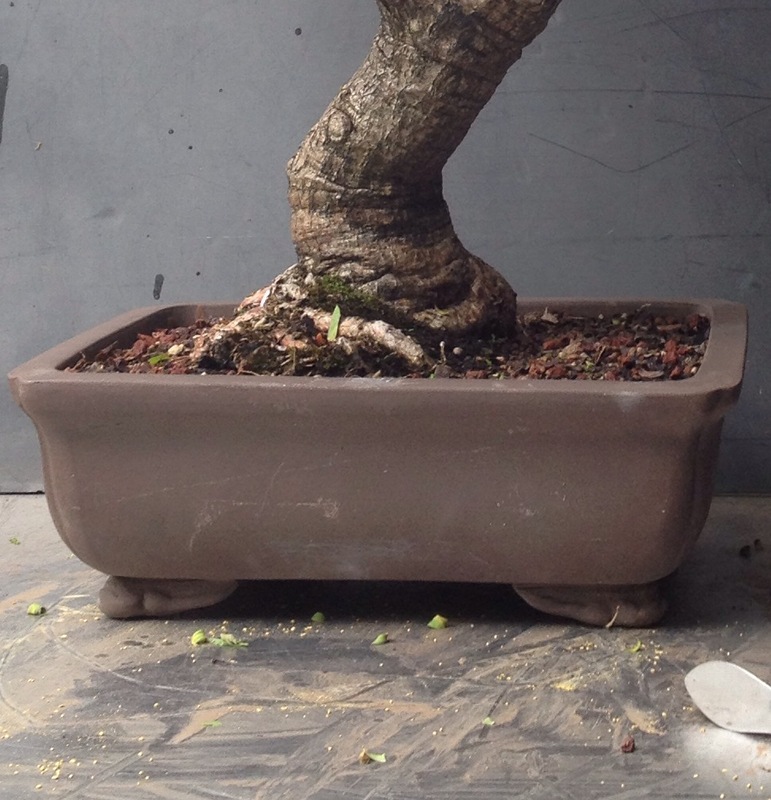 This is my first bonsai. 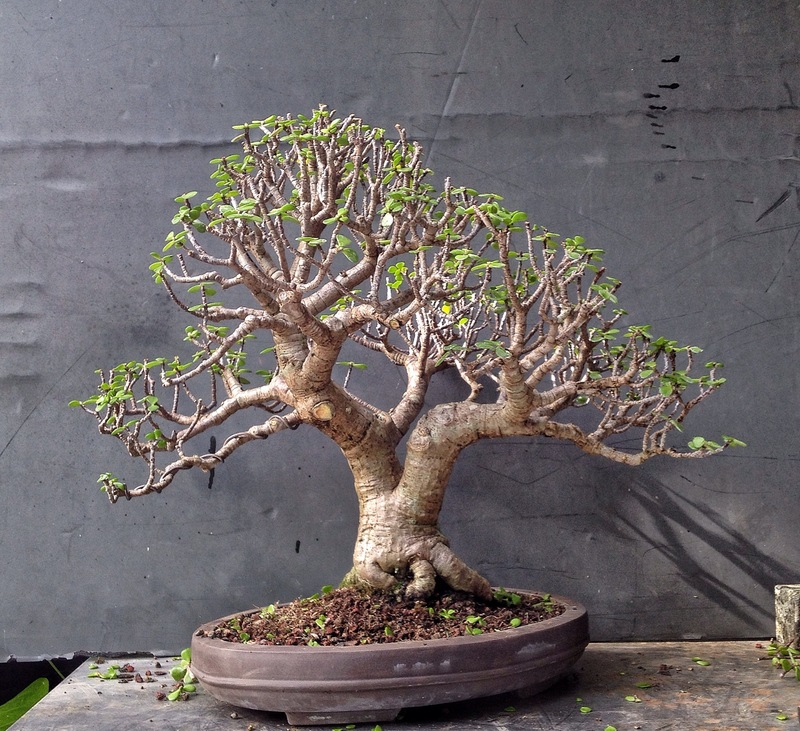 Will the lower branches continue to grow out? At what point do I know it is ready to be pruned? As long as you don’t prune them they will grow long. 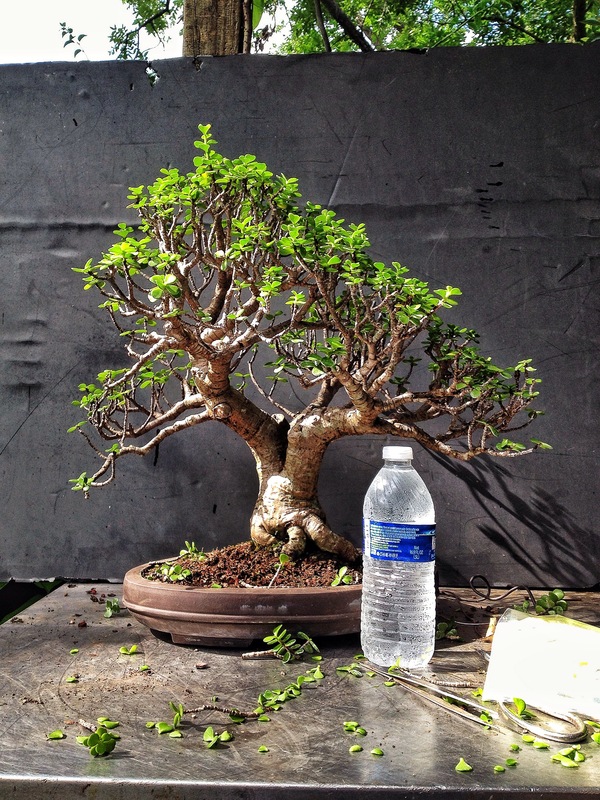 If you study treats in nature and bonsai in general you will come to know when it’s time to begin training your little tree. 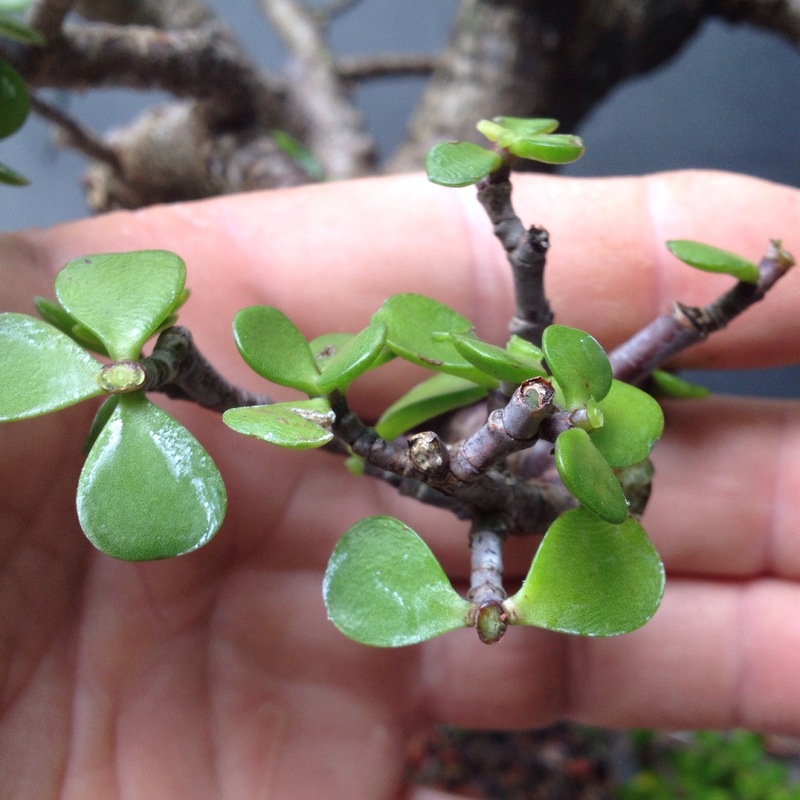 Hi,I’m from sunny South Africa and my portulacaria’s trunk are about 4 inches thick!I think that it grow better in Africa(Origin)than in America-Thanx! Can you please advise me upon this how to bring back to normal position. You may want to gradually introduce it to the outside and full sun. All my dwarf jade get full sun outside. Then water the soil just about every day. The only time you need to worry about being outside is when the temperature will be below freezing. Dear Adam here outside temperatures are too high (41 to 50+ degrees centegrade) and lot of dust thats the reason i placed plant near the window so that it can expose direct sun light for 1-2 hrs and till the sun set it can have the day light. and how abut watering the plant normally & in these conditions. also about the wrinkles please advise…… how to get rid of it. Rajesh, the plant is from South Africa in a very hot and arid area. It can handle being outside. The wrinkles are from not watering enough at the soil. Just misting the leaves is not enough. 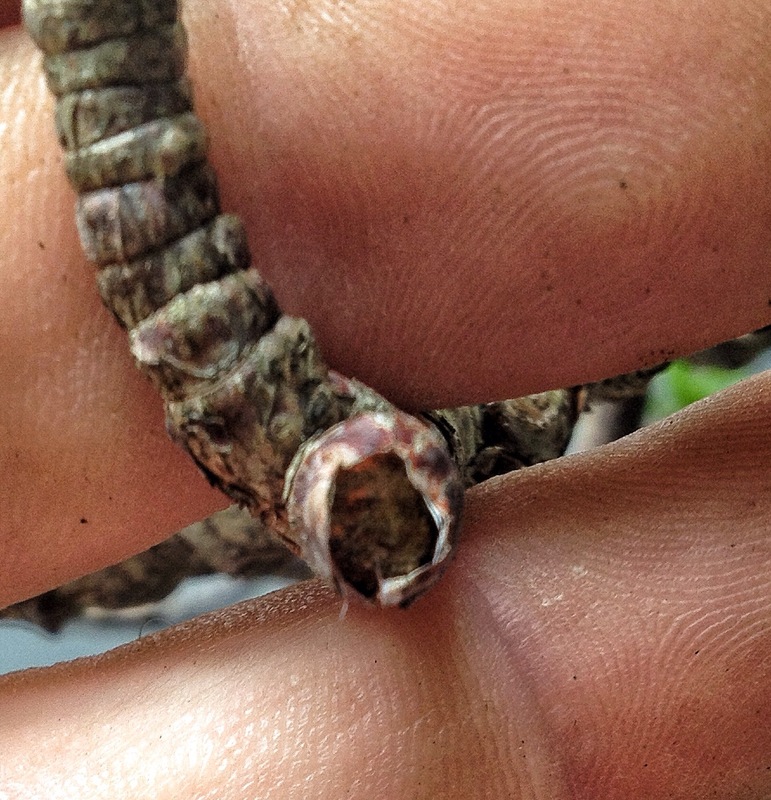 Also, the tree will shed older leaves as new ones grow so a portion of them is that. Dear Adam thank you for early reply and advise, but I need another advise I don’t have choice to place it out so can I place this at the same location or should I locate it outdoor. Please find the attached photo and advise. Sorry but you can’t attach photos to comments. It needs as much direct sunlight as you can give it. The watering will have to be figured out by yourself. It can dry out some between watering so don’t worry too much. Thank you a lot dear Adam We’ll be in touch……..
> adamaskwhy commented: “Sorry but you can’t attach photos to comments. It > needs as much direct sunlight as you can give it. The watering will have to > be figured out by yourself. It can dry out some between watering so don’t > worry too much. 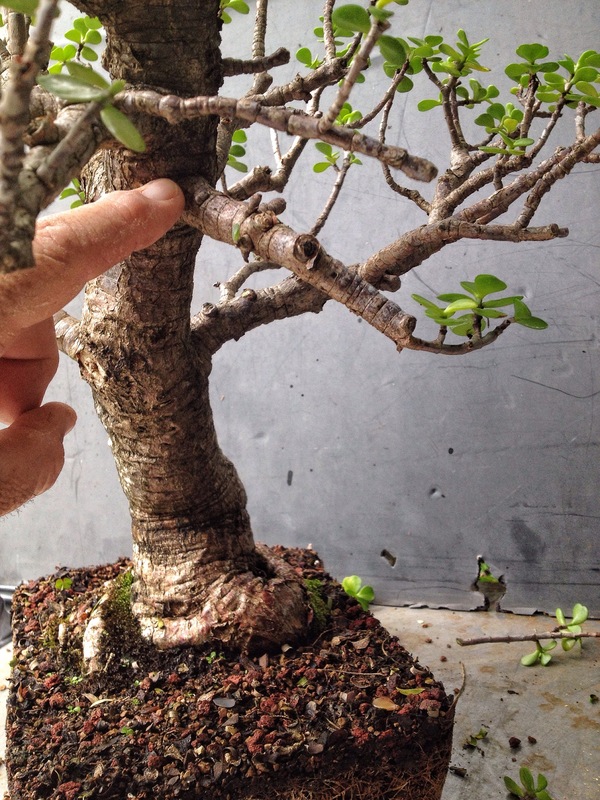 ” > Respond to this comment by replying above this line > > New comment on *Adam’s Art and Bonsai Blog * > > > > *adamaskwhy* commented > > on Dwarf Jade Bonsai Techniques > . > > in response to *rajesh aryan*: > > Dear Adam thank you for early reply and advise, but I need another advise > I don’t have choice to place it out so can I place this at the same > location or should I locate it outdoor. Please find the attached photo and > advise. 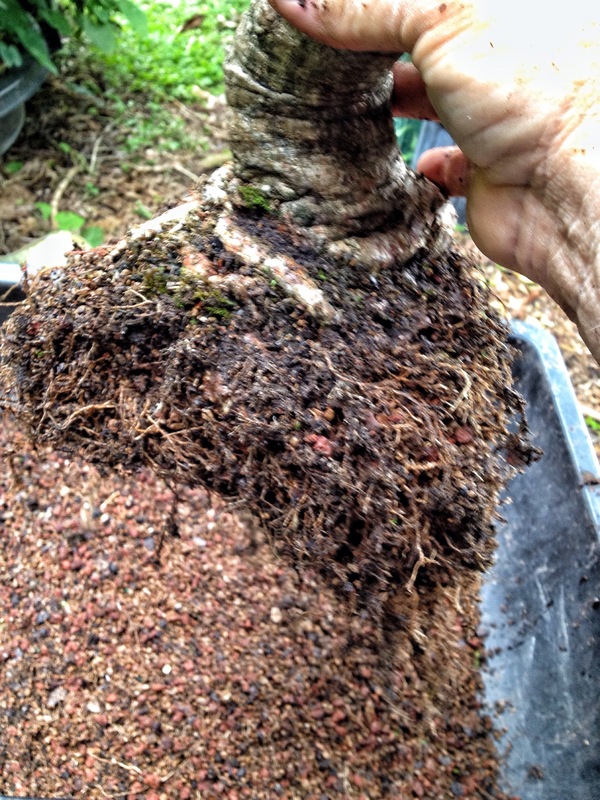 All of my portulacaria have reverse taper just at the soil line and directly above the roots. I see your jades here flare out nicely and have strong,robust bases, especially the one with the kink just above the roots. How can I develop a thick base like that? 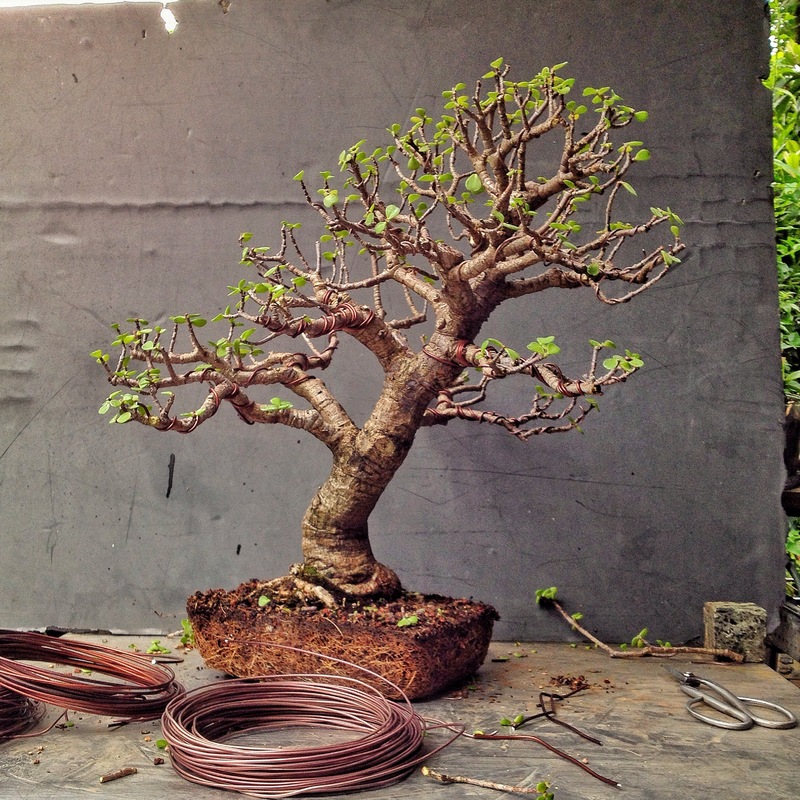 Is it done by getting a branch to grow super thick at the lowest possible internode? Beautiful trees. Thanks for the photos while writing as I am just starting out and sometimes the explanation alone is hard to visualize. Just bought some small portulacaria as I am too nervous to try training my 8 year old crassula. You’ll need to get a light dedicated to it or it won’t look much more than a houseplant. 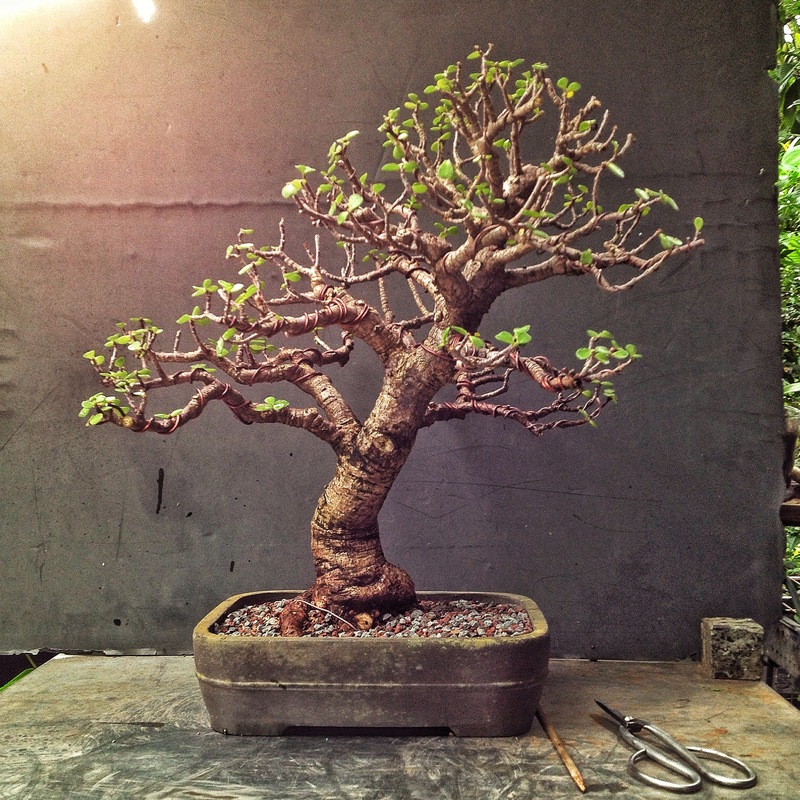 Bonsai need strong light to help dwarf the foliage and make it tree like. 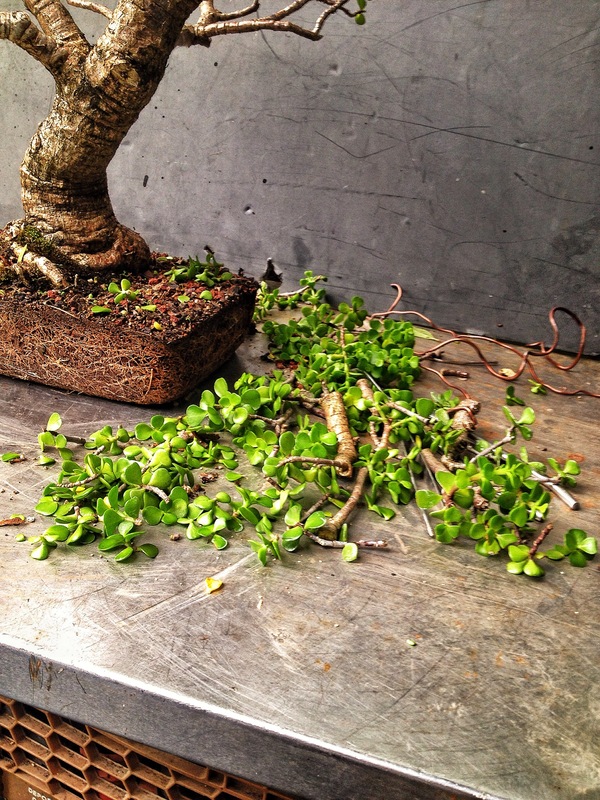 Lack of humidity isn’t a problem with portulacaria, they are a desert plant after all. Propagation has more to do with temperature than anything. 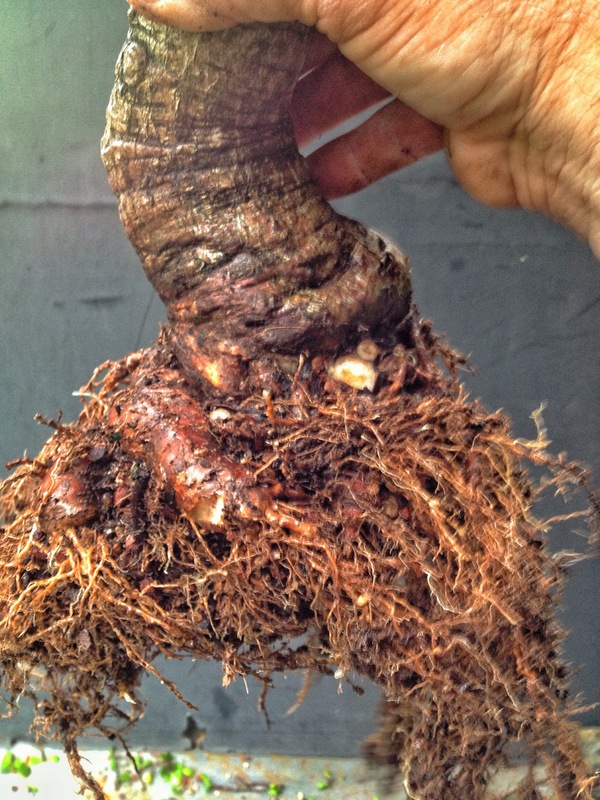 If it’s warm enough it will throw out roots. thanks alot for the answers. i’ll be checking plant growth lights then. amazon should give some pointers. sorry for the double post. i thought the first one didnt go. Hi there – thanks for the info. This is great. 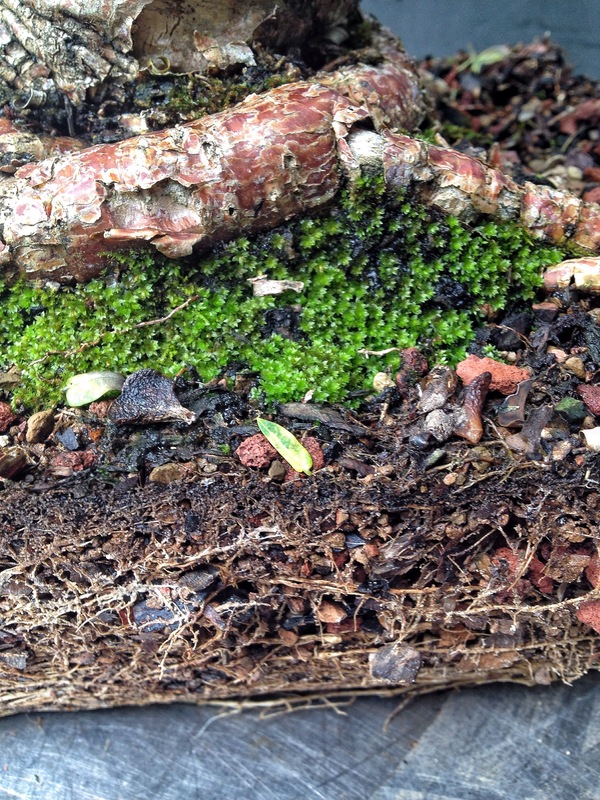 What kind of soil type and mixture are you using? Beautiful! I have a decent size dwarf jade..but am at a complete lose for a style direction. Could I possibly send you a pic for some advice? sorry if this is a repost…new to wordpress! I love your dwarf jade..simply beautiful. I have a decent sized dwarf jade..had it for yrs..but am at a lose for style direction. Could use some advice! My tree is indoors in front of an open window facing south east, zone 8a. Should I put it away from the sun after repotting? 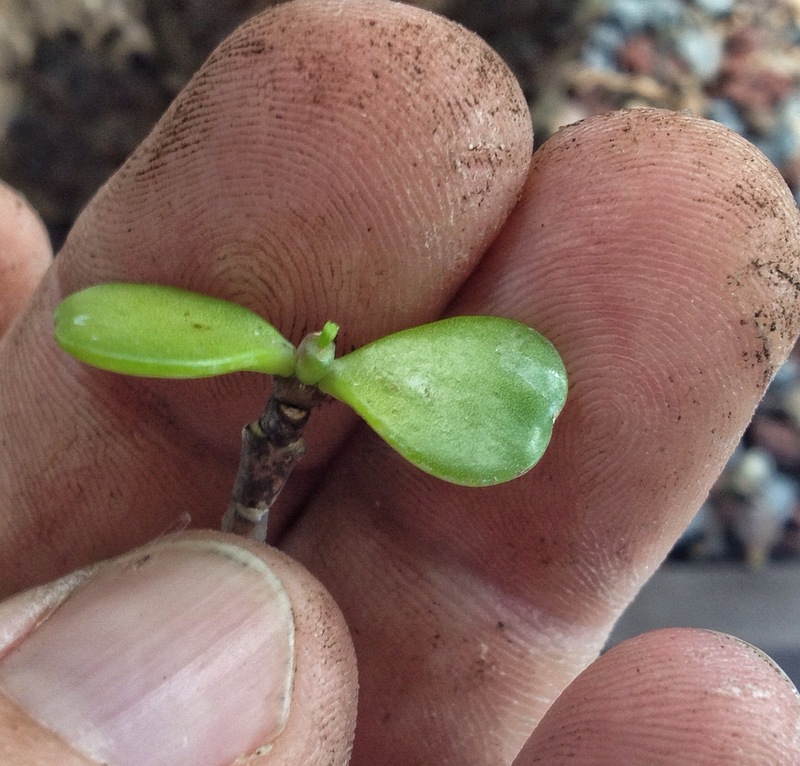 A succulent can be repotted when it is growing, which is most of the year in Florida. If it’s inside like yours that would be the same instance. You need as much light after reporting as you can give it but not so much water, if any. 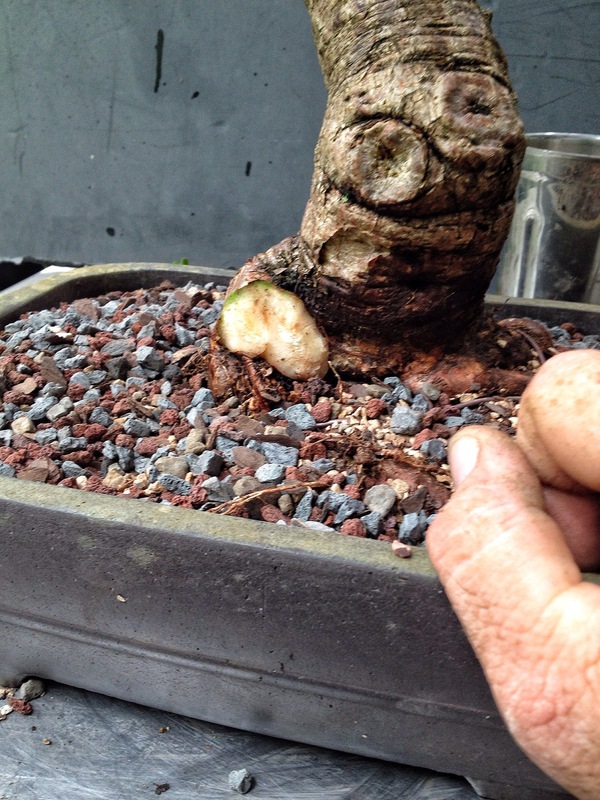 The cut or broken root tips need to dry and callous or you will get rot. What fertilizer do you recommend for these trees? 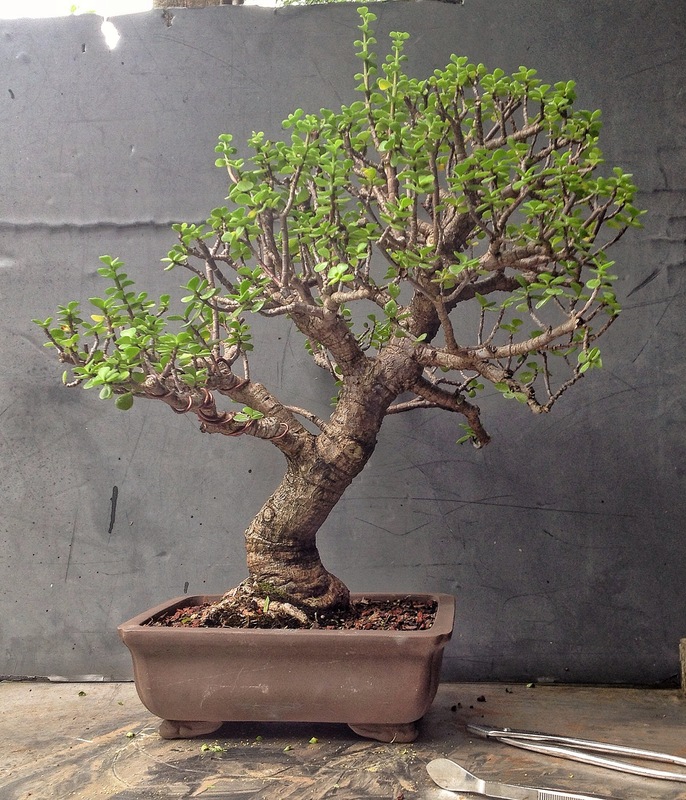 Back to dwarf jade. 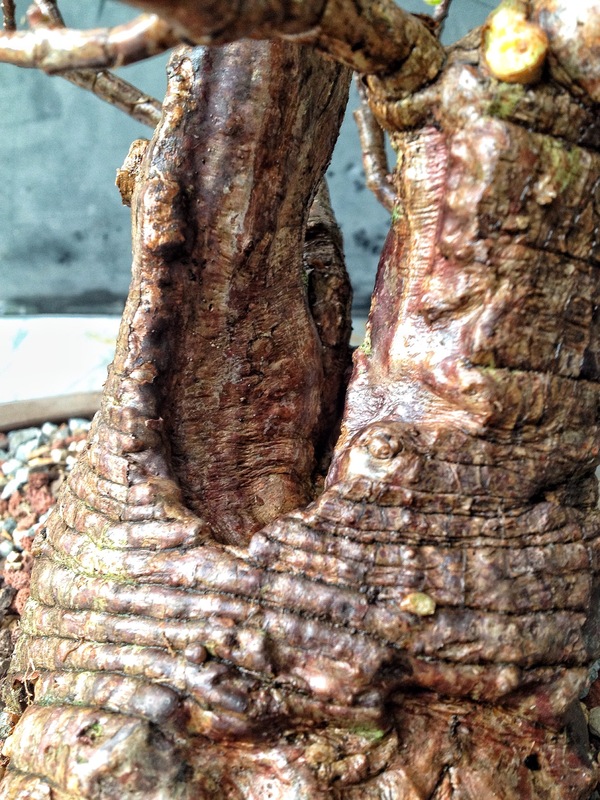 I have been growing as bonsai for about 20 years here in the cold north. You mention a heat mat in winter to see the gain. Stop right there, they love a few months of cooool. I put mine in the garage under lights in your turms 40 to 45 F. They rest then explode in the spring. Great images- becoming my favourite species, as I keep mine inside an insulated heated shed- well lit leaving me something to attend to all Winter, when all my other trees are dormant outside! 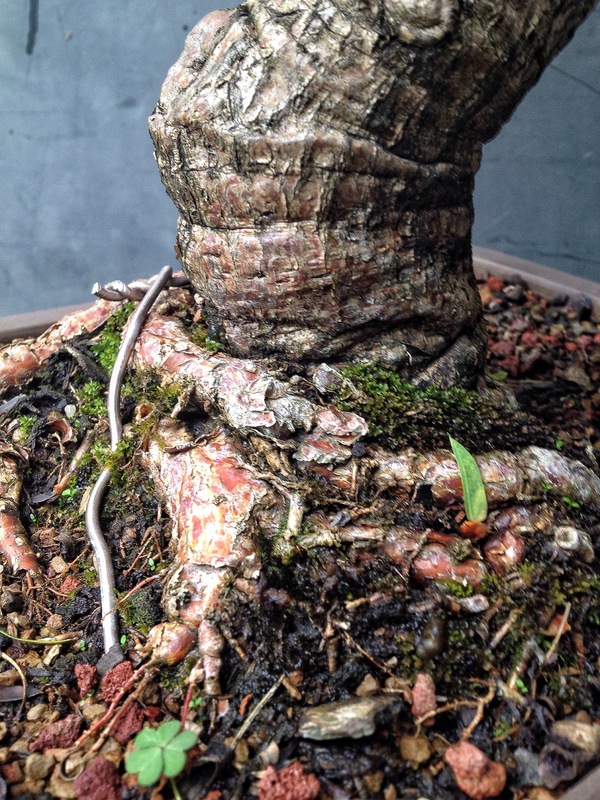 I am new to bonsai, and am only reading (I have not participated yet). I have three Jade I have had a couple of years. Is it too late to start, if one established plant already has very far, large leaves? I have always kept them indoors, and in the same pot.